This Excelvan Projector delivers 2600 ANSI lumens of brightness while consuming less than 110W of power. 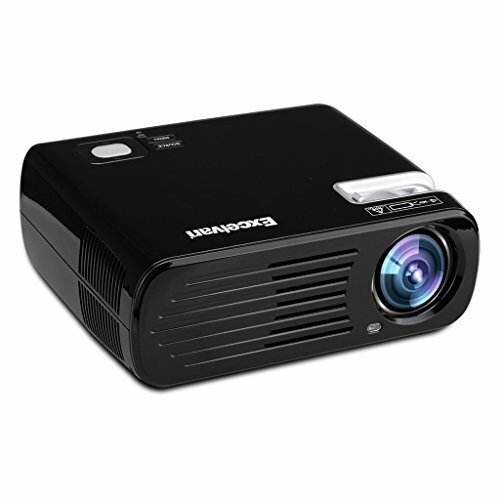 The projector supports red and blue 3D format, as well as a 2000:1 contrast ratio and 800*480 native resolutions. Two 2W built-in stereo speakers eliminate the need to carry around and hook up external speakers. Now you can share the home theater experience with family and friends! a) Support USB input, directly insert a USB flash drive or hard disk. b) Support HDMI Interface, Adapter MHL cable and I-push connection to connect with cell phone and tablet device(The MHL cable is not included). 2. Contrast ratio: 2000: 1, Brightness: 2600 ANSI Lumens. 3. Keystone Correction£º ¡À15¡ã; Speakers built-in ;Low noise. 4. Projection distance: 1.2-6M, Projection size: 32"-200".